Font Matcher is a Free portable Match a Font utility that enables you to match a font from a image or picture. Font Matcher accepts fonts that are in .BMP (bitmap) format. To use the tool, simply take a bitmap image of the letter, select your fonts directory and click Find. 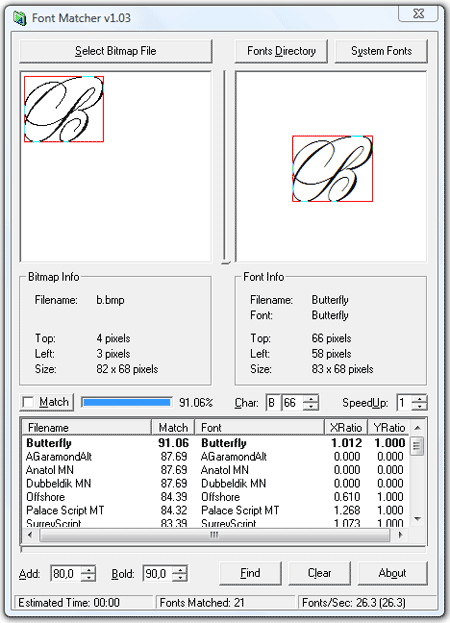 Font Matcher will proceed to compare each TTF with your bitmap, listing the font matches by percentage for your bitmap. You can then your suitable font from the matches found.